For the last month or so I haven't been able to order Skittles from Sams online. Found an alternate source for those of that live in the Midwest. Yes, it is more per ounce, but it is an alternative to the crazy high prices some online companies have. 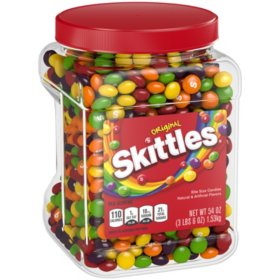 Sam's has switched to selling Skittles in the 54oz jars now so it looks like they are back in stock. it is great to know there is a closely priced alternative at Menards because my Sam's is frequently out of stock on this item. Menards saves the day again! I didn't know they sold Skittles like that, but considering how they've shifted to sell even more "bulk" grocery items I guess I shouldn't be surprised. Thanks for the heads up- I'll take any excuse to go looking at tools I don't need shopping for groceries there! Thanks GG, I didn't know Sams switched to a jar and it looks like they have plenty in stock. I prefer the bags to the jars but its not like i have a say in it. I have a feeling the skittles at Menards is a special buy so I don't know how long they will have it or if they will reorder it. The computer doesn't say whether or not it will be consistently stocked. They also have the Wild Berry which i bought a half dozen bags. The "bulk" grocery section Menards has is mostly special buys which is disappointing.